Game review: [EGD] Review #102 - Ship Wreck By Shibuvsvinayak! [EGD] Review #102 - Ship Wreck By Shibuvsvinayak! Hello, and welcome to my 102nd review and my 3rd EGD review this year. Today, I will be reviewing Ship Wreck by shibuvsvinayak. I've never really played a PPG by him before but looking at his profile, he has got a few featured games, which are mainly PPG's, so I was expecting a pretty decent game coming into it, seeing as it was featured as well. However, a lot of games have been featured for EGD this year, which in my opinion, some aren't feature worthy, so I was interested to see how good this game was coming into it. 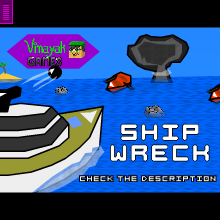 Ship Wreck is a PPG game where you control boats to fire at other boats, and if you defeat all the other boats, without all of your boats getting defeated, you win the level. Each level in Ship Wreck gets progressively harder, and the game isn't too hard to progress at first as you only have to use the ship you control and fire with. However, as the game progressed, you have to move other ships and protect them, which I found quite annoying. Also, some of the later levels were quite hard so I didn't complete the game, but the first time I played it I remember I got to the last level, and this time when I played it, I lost at level 6 before I got bored. Three people have beaten this game, so this game has got a reasonable difficulty behind it. Each level uses different enemies so there is something different going into each level to keep it interesting. However, each level had basically the same concept, just firing at other ships, which I found pretty boring after a while, even though there were a few new features added in for some levels such as mini boats, and in the later levels, rocks to protect mini boats and some of the enemy boats, so those rocks have to be hit before the other boats can be hit, which made the game a bit more interesting. Ship Wreck is a fun game to play at first because it is a different sort of PPG to what you might play on this site. However, the game was too slow paced for my liking and it wasn't addicting at all. The first time I died when I went to play this game was on level 6 and I gave up because I had no motivation to play it again. Ship Wreck is quite a boring game to be honest with you, but that's just in my opinion. Maybe the game lagged quite a bit on my computer, but even still, I didn't really like how you couldn't choose when to fire at other boats, you had to wait for a timer which would show you when the boat would fire, which slowed the game down too much for my liking. Ship Wreck has had a lot of effort into it and has a nice design behind it. It is helpful as it shows you how many lives your boats have and it shows you when your ship is going to fire as extra pieces of information on the side of the game. There are also different graphics for each boat and enemy, and there were some nice, detailed graphics in there. What really annoyed me though was how some of the mini boats drifted along without me even moving them. I don't know if this was intentional but I found it quite annoying as I moved the mini boats away from everything but later on I find I had lost the level as they were hit, and I never realised because they were slowly drifting out of position. Also, there wasn't an indication to how many lives there were for the enemy boats, so I had no idea how close I was to defeating enemy boats for new enemies in each level. Ship Wreck uses a different concept to what I usually see in a PPG, although I never really play PPG's as I can't make them very well, and a lot of them have quite annoying controls. I'd imagine that Ship Wreck has an original concept behind it though, as I don't recall playing a PPG where you fire at other enemy boats. However, it is still a pretty simple concept, and I'd imagine something similar has been used in other PPG's before. Each level was basically the same, and this got quite boring after a while. If there were no graphics, this would probably look like your typical sort of PPG. In some of the later levels, Ship Wreck had some rocks placed in to protect your mini boats, which I found a good idea because it stopped your mini boats from getting defeated too easy as levels became progressively harder as there were more enemy boats to defeat. It was a pretty simple idea as well, as once the rock has been fired at one time, it is removed, and it doesn't damage any of the boats. In some of the levels though, I found a pretty simple way to essentially cheat the game, as I could destroy some of the easier enemies on one side of the play field, put my mini boats on that side once they were destroyed, and then just destroy the harder enemy boats on the other side of the game field. This could have easily been avoided with an even distribution of difficulty of enemy boats across the play field. Overall, this game deserves a 3/5. In my opinion, this game isn't feature worthy as it wasn't entertaining enough for my liking, but because it is EGD, it was probably always going to be featured. Ship Wreck had a nice design behind it, with some nice graphics, but some of the game was a bit sloppy and although it has had a lot effort put into it, there isn't really a lot to intrigue the player.